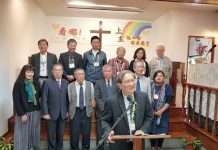 Since 1988, Evangelism Committee and Taiwan Church Press of PCT have been working together to promote the New Eyes Bible Reading Movement. Seasonal devotional booklets have been published since 2000. There will be three sharing gatherings of “New Eyes Bible Reading” in July to facilitate the use of booklets; July 13th at Chung-Shan Church (Taipei), 20th at Lek-Heng Church (Taichung), and 28th at Chao-Chou Church (Pintung). Rev. 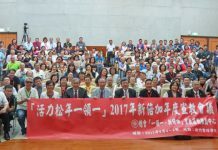 Yang-en Cheng (Taiwan Theological College and Seminary) and Rev. Kong-hi Lo (Tainan Theological College and Seminary) will be the speakers, and the writers of booklets will communicate with users. New Eyes Bible Reading Movement was launched by Christian Conference of Asia (CCA). According to Rev. Nan-hsin Tsai, there are two reasons for advocating New Eyes Bible Reading Movement. First, the Bible is the message proclaimed by the living God in society today. Secondly, the message of the Bible is proclaimed to liberate God’s people from suffering. Therefore, reading the Bible with New Eyes is to assure that the Word of God would combine with society wherein the Church, and with people’s experiences. This corresponds to our Confession of Faith that the Church identifies with all its inhabitants, and through love and suffering becoming the sign of hope. In Sep. 1997, General Assembly held The Seminar of New Eyes Bible Reading in Asia, followed by four seminars of the theology and method in different parts around the country, and “The Promotional Booklet of New Eyes Bible Reading” was published. The movement started in 1998, and the schedule was to read the whole Bible in three years. Taiwan Church Press included the column of “Weekly New Eyes Bible Reading” in the newspaper, and the articles were compiled and published as a booklet. “Manual for Leaders of New Eyes Bible Reading” was published in 1999, and “Daily New Eyes Bible Reading” has been published every season since 2000. In 2001, the promotion team of New Eyes Bible Reading set out the schedule to read the whole Bible in six years. “Daily New Eyes Bible Reading” and “Weekly New Eyes Bible Reading” were combined and published every season. Revised Common Lectionary used by ecumenical churches was implemented in 2007, as texts for four days of a week. In reference to mission stories, historical events and cultural festivals of Taiwan, texts were chosen for the other three days of a week. It helps Christians to have a better understanding of the life of Jesus and more related to their faith experiences, so that they can live out the teachings of faith. This year, “Daily New Eyes Bible Reading” resumes the schedule of reading the whole Bible in six years and systematically guides believers to read carefully through the Word of God, while “Weekly New Eyes Bible Reading” continues to use Revised Common Lectionary. Current circulation of each season is nearly 52,000 copies, and there are 1,016 churches of PCT using the booklet. In the past, Writing Workshop for New Eyes Bible Reading was held twice a year. However, there was no direct communication between writers and readers. The three sharing gatherings of “New Eyes Bible Reading” in July this year will assist people to better use the booklets, provide practical help for living out the faith, and listen to users’ opinions. Rev. Yang-en Cheng will give a speech on “Reading Exodus in the perspective of Church history” at Taipei, and Rev. Kong-hi Lo will give a speech on “Reading Exodus with New Eyes” at Taichung and Pintung. Moreover, writers including Reverends Chin-shun Kang, Fang-chou Wang (Taipei), Chih-chang Tai, Kumu Tapas (Taichung), Chih-jen Wu and Vuluk (Pintung) will be there to communicate with readers.